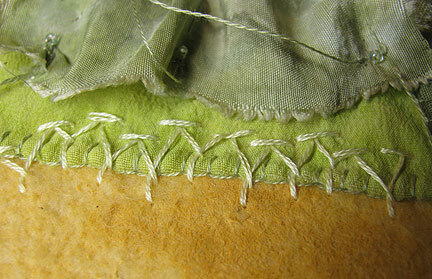 This week for Take a Stitch Tuesday we looked at the knotted Cretan stitch! I love all the viney types of stitches we've been doing, because they all fit really well with the underwater theme of my manipulated fabric quilt. I placed three rows of very (deliberately) uneven knotted Cretan stitch near the herringbone stitch that we did for week 5. I'm liking the two together. A guest post tutorial by Paul Bishop of Bishop Wire & Bead. Paul first shared this amazing wire necklace with us at the beginning of this month as we transitioned from Spring Fever Month (April) to Celebrating Wire Month (May). 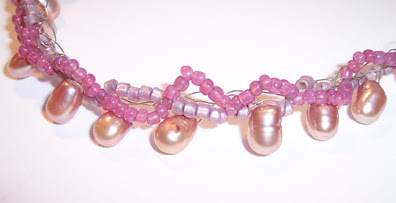 Thank you so much, Paul, for making this tutorial available free exclusively to readers here at Beading Arts. You can download the pdf file for Midnight in the Garden of Good and Medieval at this link until July 28th! 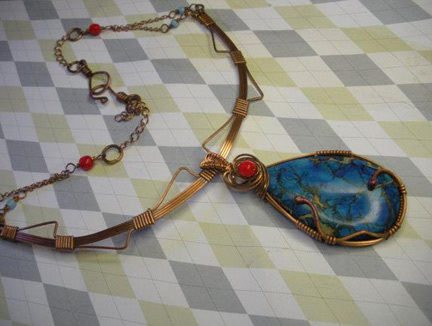 This tutorial will explain how you can make this lovely, artful necklace. 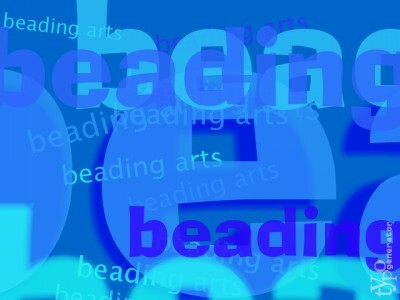 This will be a limited-time exclusive free tutorial for Beading Arts readers. Later, it will be available for purchase on my Etsy site, after I've expanded with detail pictures. 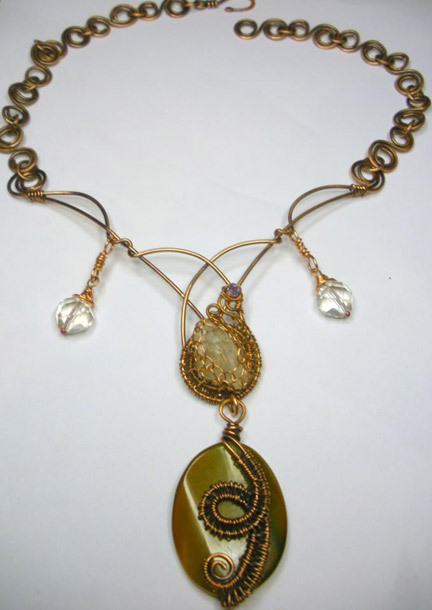 This necklace was originally created free-hand, and I worked off wire spools. Wire lengths are not possible to provide at this time. To finish the necklace I used a black chain. The finished inner length of my framework design is 9 inches. Take that into account when deciding how long to make the chain. I suggest you do a custom fitting or use a chain with large enough links that you can clasp the chain for anyone who tries it on until it fits, and finish the necklace when the sale is completed. This tutorial is long because there are a lot of components to make, plus the construction. As with my other tutorials, the steps are well-detailed. These materials will create this piece. If you want to make it in your own colours, just make sure the wire and jumpring colours match. 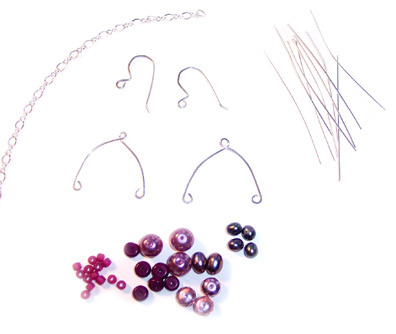 - Black annealed steel wire, a heavy gauge for the framework and a lighter gauge for the beads. Mine were 19 and 28. - If you've having trouble finding black annealed steel wire, it's available cheaply in a hardware shop. I paid $3.40 CDN for 50 feet of 19 gauge, and the same for 100 feet of 28 gauge. That's a lot of wire. - Black annealed steel is soft but quickly becomes work-hardened. 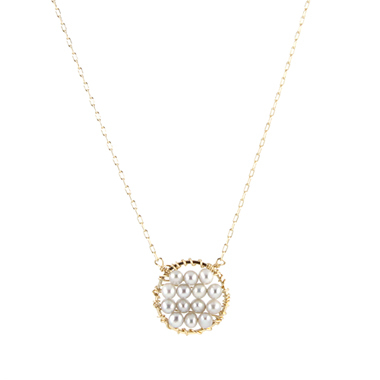 The necklace will look delicate but is actually quite sturdy. - I worked off the spool so I do not know how much wire I used. However, at per inch costs of 0.006 and 0.002, I know I used less than 50 cents worth of wire and didn't worry about waste. - Aside from the cost of the garnets, the real cost of this item is mostly the time spent to make it. Most of these will not be described as you can find excellent tutorials by Cyndi here at Beading Arts, on the web or in the "Basics" sections of beading magazines. 1. Take one headpin and place a 4mm, a 6mm and a 4mm garnet bead on it. 2. Using your round nose pliers, make a wrapped or simple loop at the top, large enough for the jumpring to pass through. If your headpin wire is very soft, use a wrapped loop. 3. Repeat steps 1 and 2 until you have six dangles. The loops for these components must be wrapped, because they use thin wire but will bear weight. 1. Working from the spool of 28 gauge wire, slide 5 6mm garnets onto it. 2. Make a wrapped loop on the available end of the wire. This loop must be big enough to accommodate the 19 gauge wire. 3. Slide the beads toward the wrapped loop. 4. Measure 2 inches past the last bead and cut the wire. 5. Use that wire end to make another wrapped loop. 6. Repeat steps 1-5 for the second connector. In step 5, you can form the leaf free-hand, or draw a leaf on paper and manipulate the wire on the paper to match. Keep the curves simple so it can be easily wired with beads. 1. Cut a 19 gauge wire of at least 5 inches long. 2. Use the ruler to find the center and mark it. 3. Grab the center with the tip of the pliers. 4. Using your other hand, bend the wire up and as close together as you can. 5. Pull the wires apart slightly and form a leaf shape. The wires should come together at the top horizontally pointing in different directions. 6. Place the smaller mandrel at the top of the leaf above the two wires, perpendicular to the wires. 7. Draw the front wire up and around the mandrel a full turn back to the direction it originally was. 8. Do the same for the rear wire to the back of the leaf. 9. Slide the mandrel out of the coil you just created. 10. Clip the ends of these wire to about and inch from the coil. 11. 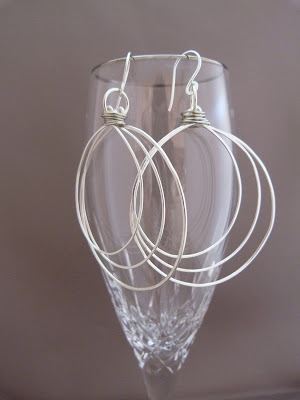 Using the tip of the pliers, grab the ends of the wires and curl into small spirals. 12. Using a thicker part of the pliers, bend the wire to approximate a short vine. You should now have a leaf shape, but the loops at the top are separate. This is okay for now, since it will make beading the leaf easier. 1. Using the string, tightly wrap the string around the 1 inch mandrel for three and a half full turns. Cut the string at the three and a half turn length. 2. Stretch the string onto the ruler and measure it. This is the length you'll need to make two identical components. 3. Cut three pieces of wire to the length of the cut string. Lay one aside for the center coil form. 5. Place your finger on the coil where the wires cross the final time. 6. Use the pliers to roll a small loop back toward the top of the coil. The loop should be on top of the coil, not rolled underneath. 7. Turn the mandrel around in your hands, retightening the coils if necessary. 8. Loop the other end back, keeping the small loops consistent. 9. Release the wire carefully and slide it off the mandrel. 10. Repeat steps 4-9 for the other connector. 11. 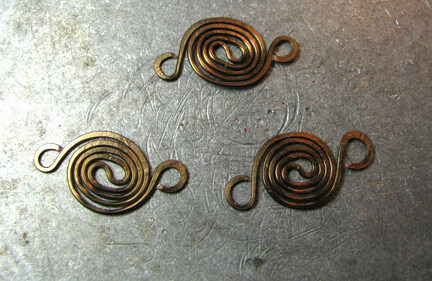 Take one coil and hold it by the loops in your fingers, one loop in each hand, with the coil above the loops. 12. Very gently and slowly uncoil the wire by pushing the loops "back the way they came". The coil will become larger and spread apart. You need to keep the pressure even to make the shape fairly symmetrical. 13. When the holes of the two loops overlap in the middle of the new shape, you are almost done. Push them a little past each other, and then let go. Push or pull gently with the curve to make the loops overlap so they stay close together when you let go. 14. Repeat steps 11-12 for the other coil. 1. Using the third 19 gauge wire previously cut, follow Side Coil steps 4-9 to create your coil. 2. Take the coil and hold it by the loops in your fingers, on in each hand with the coil below the loops. 3. Very gently and slowly pull the coils apart in opposite directions. The coils on the ends will stretch out and the space where the wires cross will get smaller. You are aiming to keep the result symmetrical. 4. Let go of the wire and tweak it with your fingers to fix any symmetry issues. 5. Your shape is most likely linear. Take the ends again in your opposite fingers and gently bend the shape into a V or U. There are two ways to decide the amount of wire you need for this. The first way is described below in six steps. The other way is to shrug, cut a piece and not worry about it, because black annealed steel wire is cheap and you can always add wire and reuse extra. 1. Lay the leaf on the table as if you were looking at someone wearing it. 2. Lay the ruler on top of it and find the largest width and add 0.5 inch. Record that number. 3. Fill the leaf with lines of beads. Leave a gap on each side to accommodate the 28 gauge wire that will wrap the frame. 4. Count the rows of beads. 5. Multiply the row count by the number from step 2. That's a generous figure for the amount of 28 gauge wire you need. 6. Cut the length of 28 gauge using the number from step 5. 1. Place your 29g wire near the bottom of the leaf, below the point where one bead would fit in the frame. 2. Wrap the 28g wire around the 19g wire, keeping coils tight and close together. To get the wire around the frame easily, pass it through the gap at the top, where the coiled wires are not joined. 4. Keep wrapping until the frame is wide enough to accommodate a bead. Slide the bead onto the wire as close to the frame as possible. 5. Wrap the 28g wire around the 19g frame and up on the far side of the bead, until you have cleared enough to add another row of beads. 6. Repeat beading and tight wrapping up the frame on opposite sides until you cannot fit any more bead rows into the frame. 7. Wrap off the wire several times at the top of the frame. If you ran out of wire, cut it at the most recent FULL set of frame wrapping. Cut another piece and wrap over the last wrap, careful to tuck in the wire ends, and continue. 1. Set all the components in position on your work surface using the image as a guide, then connect the pieces in the following order. 2. Open all of the jumprings. 3. Open the ends of the coil components as if you were opening a jumpring. 3. Using a jumpring, attach the leaf to the middle coil of the Center Coil Form. Close the jumpring. 4. Slide one bead connector onto the small loop on one end of the Center Coil Form until it rests on top of the first coil loop. Close the small loop you just slid over. 5. Slide the other end of the bead connector onto the lower small loop of the matching Side Coil Form so the bead connector hangs off the bottom of the coil. Close the small loop you just slid the bead connector over on that Side Coil Form. 6. Repeat steps 4 and 5 for the other bead connector on the other side of the necklace. 7. 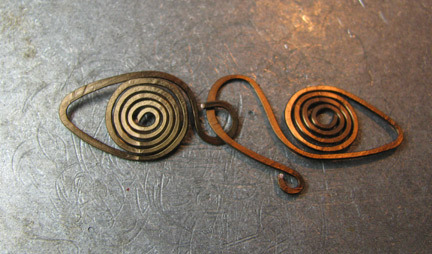 Connect a bead dangle to each small loop in the Center Coil Form. Close the jumprings. 8. At each outside LOWER intersection of wires on the side coil loops, attach a dangle and close the jumprings. 9. Slide the chain onto each side on the upper small loops of the Side Coil Forms. Close the small loops. 10. At each outside UPPER intersection of wires on the side coil loops, attach a dangle and close the jumprings. 11. Finish the chain and clasp as necessary. Copyright 2012 Paul Bishop. All rights reserved. Not to be reprinted, resold, or redistributed without permission. Trillium, who writes Trillium Creates, is the winner of the wonderful new book Show Your Colors! 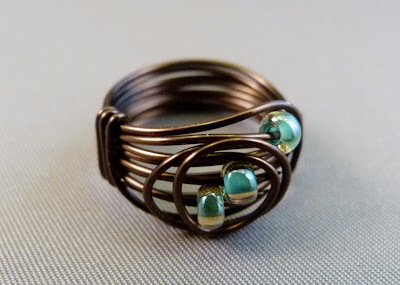 Have you done enough wire work that you feel comfortable with the basics, and now you'd like to see some beautiful ways to put them all together? 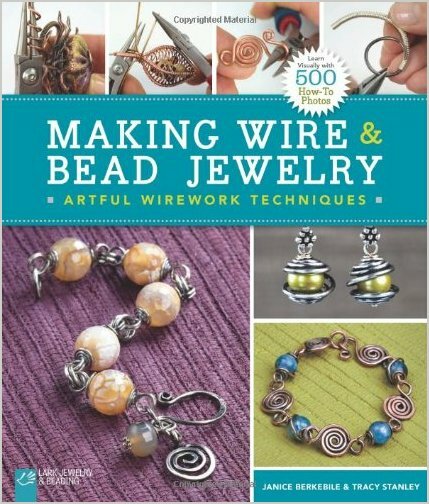 Then you're going to love Making Wire & Bead Jewelry by Janice Berkebile and Tracy Stanley. There are 2 dozen projects which will challenge you to use those basic skills in easy but elegantly attractive ways. But wait! Do you need to learn the basics first or brush up on your skills? The techniques section will walk you through, with attention to detail and precise instructions. Are you a visual learner? Maybe books don't always have enough details for you. I think you'll be pleasantly surprised then. The claim to fame of this book - besides the gorgeous projects - is the 500 how to photos! Each step is carefully described and illustrated by the usual fabulous Lark Books photography. I was very inspired by a free form flower created by Janice. As usual, I didn't end up following the directions, but instead made it into my own rendition. My versions ended up on a bead embroidery necklace that I hope to be able to share with you next month, and I need to give Janice the credit for the creative nudge! Lark is giving away of a copy of this great book, signed by Janice Berkebile and Tracy Stanley, U.S. residents only, ending on May 28, 2012. Hurry over! If you'd like to try out a few projects, Lark has kindly made these two available on their blog. We met Vanessa Walilko, who runs Kali Butterfly last year, and so I asked her if there were anything new wire projects in her life. Oh yes, there certainly are! The biggest news is that I recently created a Kickstarter campaign to raise funds for my most epic chainmaille project, a chainmaille wedding dress. The Kickstarter campaign was fully funded (and then some). You can read all about it here on the Kali Butterfly blog. I'll have to link together 100,000 rings together to complete it. :) In other news, my chainmaille flapper dress was chosen as a finalist in the Bead Dreams competition. 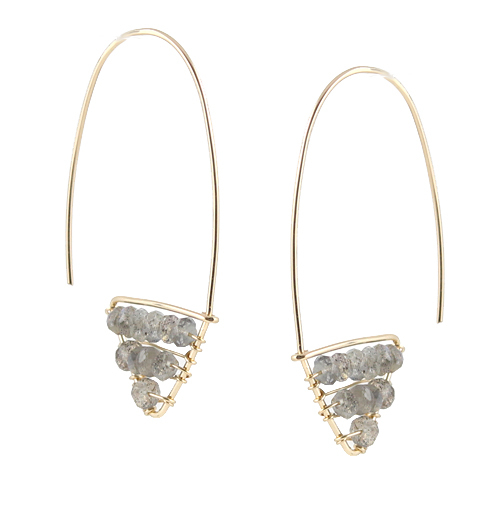 These delicate earrings are well-balanced to give you a lot of volume and movement without too much weight! 1. If you want to make your own earwires rather than using pre-made ones, cut a 5 inch piece of 20 gauge sterling silver wire in half. Wrap a small loop at the end of each 2 ½ inch piece and bend the wire approximately 90 degrees away from the loop. Form the wire with your fingers or around a pencil or jig and adjust the curve until you are satisfied. Clip off the other end if it needs to be a bit shorter, and bend the tip up slightly. File the end of the wire very well so that it doesn’t scratch your ear when you insert it. 2. 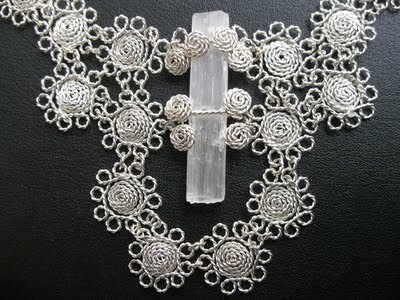 Cut a 6 inch piece of 20 gauge sterling silver wire in half, and wrap a small overlapping loop in the center of each piece. Form the sides with your fingers or around a jig, and turn a very small inward facing loop on each end of the wires. Flatten each arm of these connectors slightly with your hammer. Be careful not to strike where the wires cross each other. At the same time, flatten just the back half of the curve of the earwires, the part closest to the turned loop. 3. Cut two 1 inch pieces of chain and two 2 ¼ inch pieces. Slip the ends of the long piece into the turned loops of your connector first, and then add the short piece. Tighten the loops well so the chain will not slip out. 4. 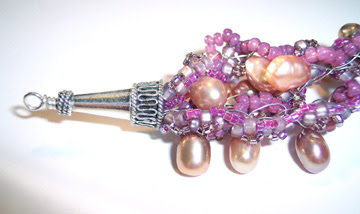 On headpins, hang your pearls, crystals, and gemstones, adding an occasional 8/0 seed bead for size and color where you desire. 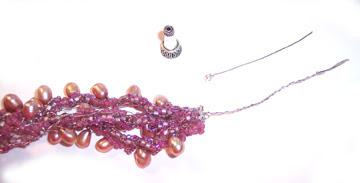 Turn a simple loop right above each bead and clip the ends. Space the beads out and hang them from both pieces of chain, 7 per earring. 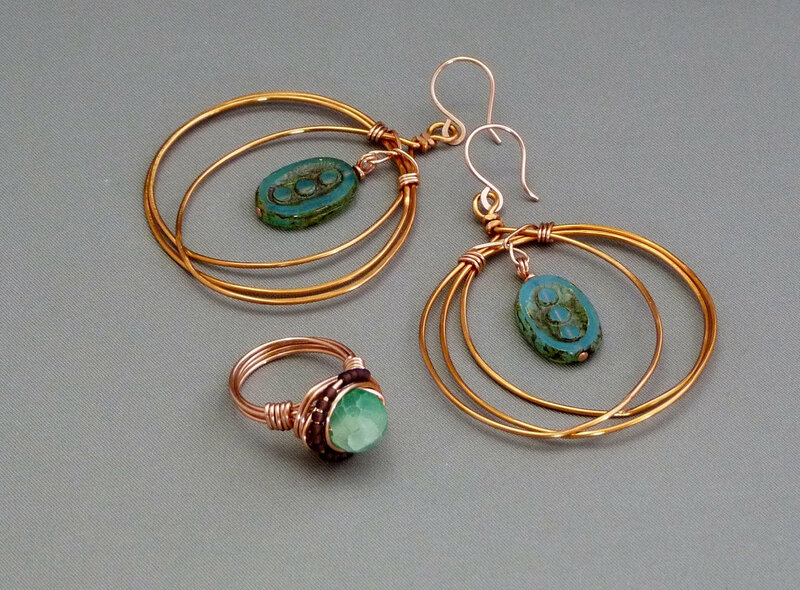 Gretchen creates modern, stylish, and affordable wire wrapped jewelry. 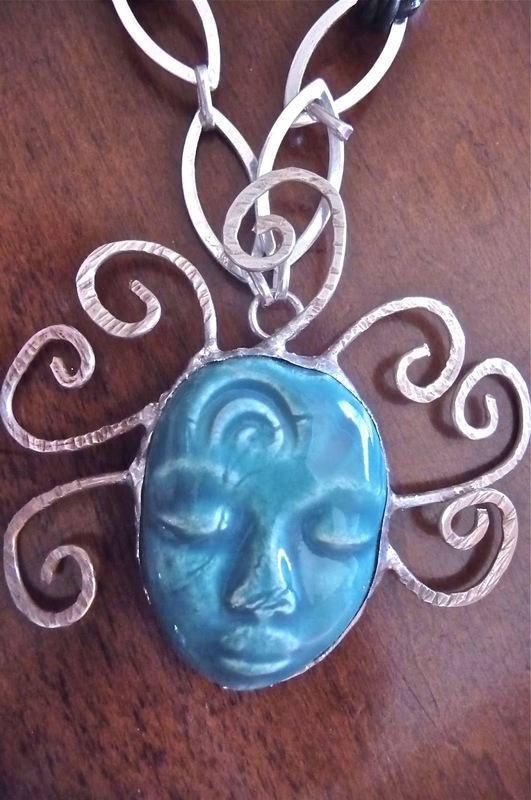 She uses a variety of metal wire, gemstones, beads, and rocks in her unique creations. She has a number of signature designs and is constantly brainstorming new ones. 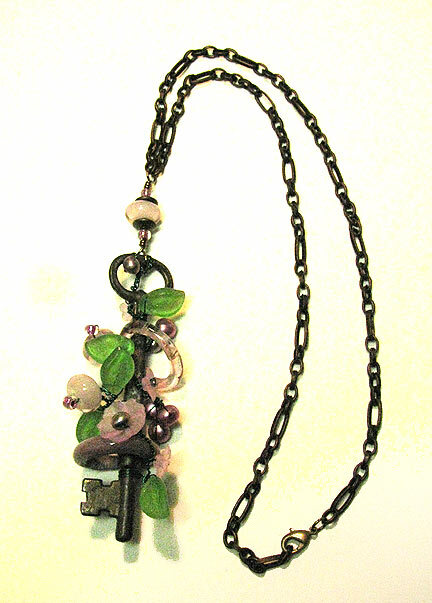 Gretchen loves repurposing vintage beads as often as possible and is eco-friendly conscious in all production processes. Her inspiration comes from the challenge of looking at a spool of wire, and some beads, and contemplating what to make next. Gretchen starting making jewelry when she and her little boy started collecting rocks on the beach. 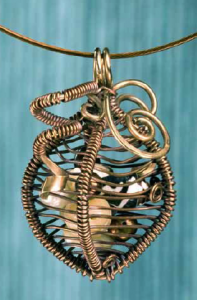 She experimented with wire wrapping the rocks into pendants and it took off from there. Wire wrapped rings have been her biggest sellers, but earrings are now a close second. She has sold jewelry to customers all over the world. Gretchen is a proud member of The Artisan Group, an exclusive, juried group of artists who gift their handcrafted products to celebrities at Hollywood's top gift lounges, and in special gift bag opportunities. 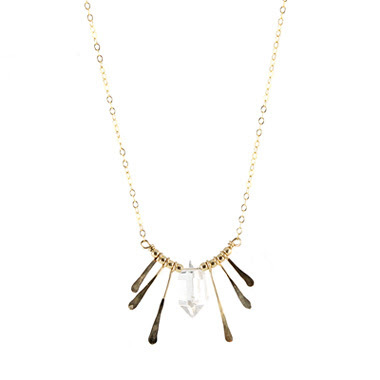 Celebrities such as Hilary Duff, Cari Cucksey (of HGTV), and Rachael Ray have received gifts from Gretchen Hind Designs. Gretchen will be gifting the press in the upcoming GBK's MTV Movie Awards Gift Lounge, in June, and the GBK 2012 Primetime Emmys Gift Lounge, in September. In fact, she just found out that she's been selected to have her jewelry included in a special gift bag for Tyra Banks, in early June! A fabric bead is always fun to create and uses up leftover beads too! Working in a shell pendant with resin...difficult but possible! What do you think of the idea of making your business more successful? Sound good? Check out what's on Jean's blog today! Get your crystals ready, the Swarovski Elements design contest sponsored by FireMountainGems opens June 1st!! 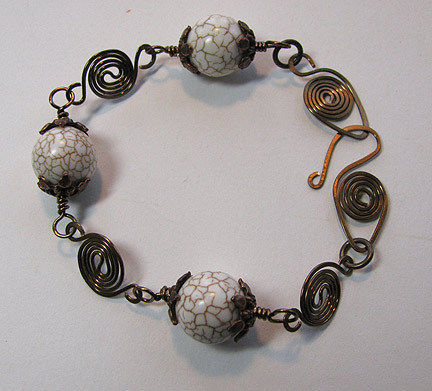 Tammy has some jewelry tutorials that incorporate ceramic pieces in them. Art Bead Scene highlights some of the handmade beads that are entered in the Bead Star competition. Come and see some of the entries and place your votes for your favorites! 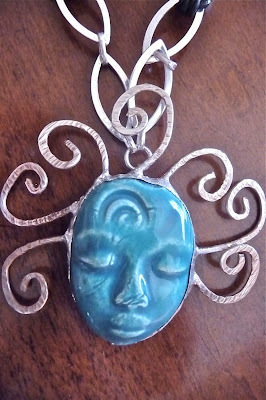 Using hand wire wrapping and soldering I mix wire with sparkling crystals, upcycled stained glass, ceramic faces and more. 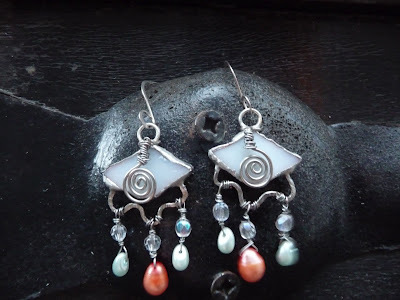 You'll find some of the most beautiful and one of a kind handmade jewelry around. 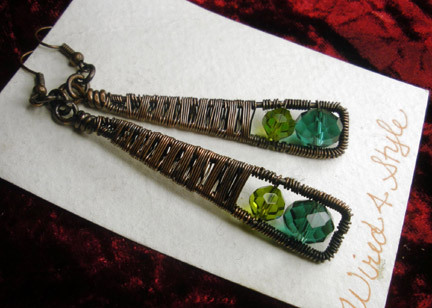 Sharon Lowery is the winner of our Making Wire Jewelry giveaway! Congratulations, Sharon! This week for Take a Stitch Tuesday we visited with a beautiful stitch, the bullion knot! 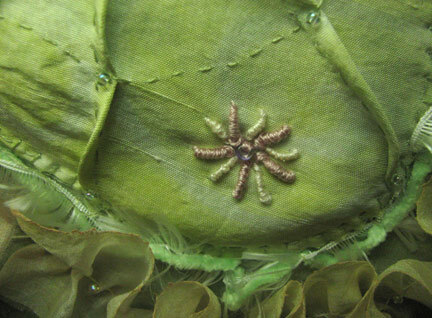 The usual thing with bullion knot is to use it to form flowers or flower buds, so I decided that I'd make a starfish to go along with the underwater theme of my manipulated fabric quilt. 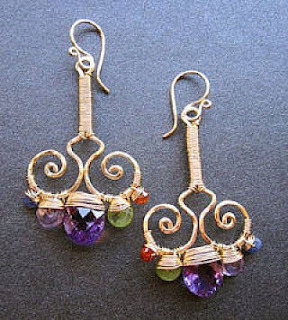 Bonnie has put together lots of fun new styles for Spring 2012 at Calico Juno Designs! We've seen Bonnie's work here several times during our annual Wire Month. For part one of this tutorial, Creating the crocheted front, please visit the link to find last week's post! 1. Measure your finished crocheted piece and determine how long you want your straps to be. 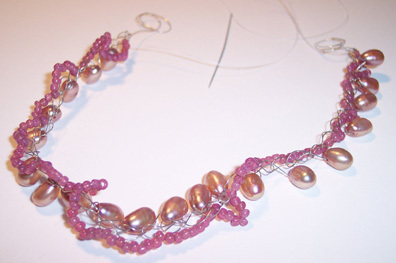 Cut two pieces of beading wire, each about 4 inches longer than the intended finished length. I made each of my straps about 3 inches long. 2. 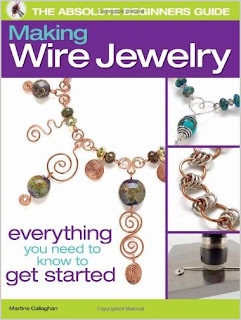 Slip a crimp tube and a glass bead or two over one end of the first piece of beading wire. Pass the end through one of the wrapped loops and back through the beads and the crimp. Tighten and flatten the crimp with your pliers. 3. String your Czech glass, stone, and additional pearl beads in a pattern that pleases you, alternating these larger beads with 8/0 seed beads. 4. At the other end, string a crimp bead and another glass bead. 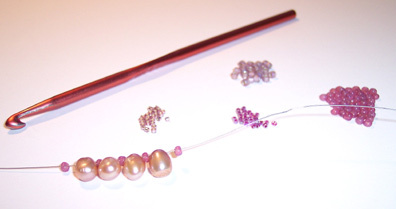 Pass the end of the beading wire through the toggle end and back down through the crimp tube and several more beads. Pull snug and flatten the crimp. Clip the wire end close and push any raw edges into the next bead. 5. Repeat for the other side, taking that end through the toggle bar. I have been a jewelry designer for over 10 years. I started making jewelry for myself and people would stop me on the street and ask where I got the pieces. Soon I decided that I'd like to sell my pieces, mainly so I could keep buying new beads! Since then, my work has been featured on TV shows like "Buffy, the Vampire Slayer", "Private Practice" and in the movie "Superbad". I've also had my pieces in magazines like Oprah and Lucky Magazines. 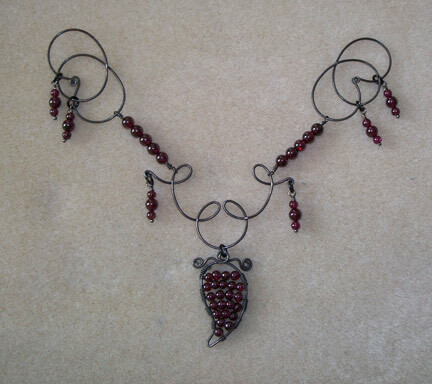 It's been a great ride designing and creating jewelry pieces that I love, in a medium that I love, beads and wire. 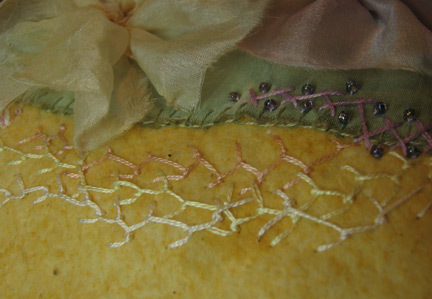 There is so much instant gratification to wire and bead work! 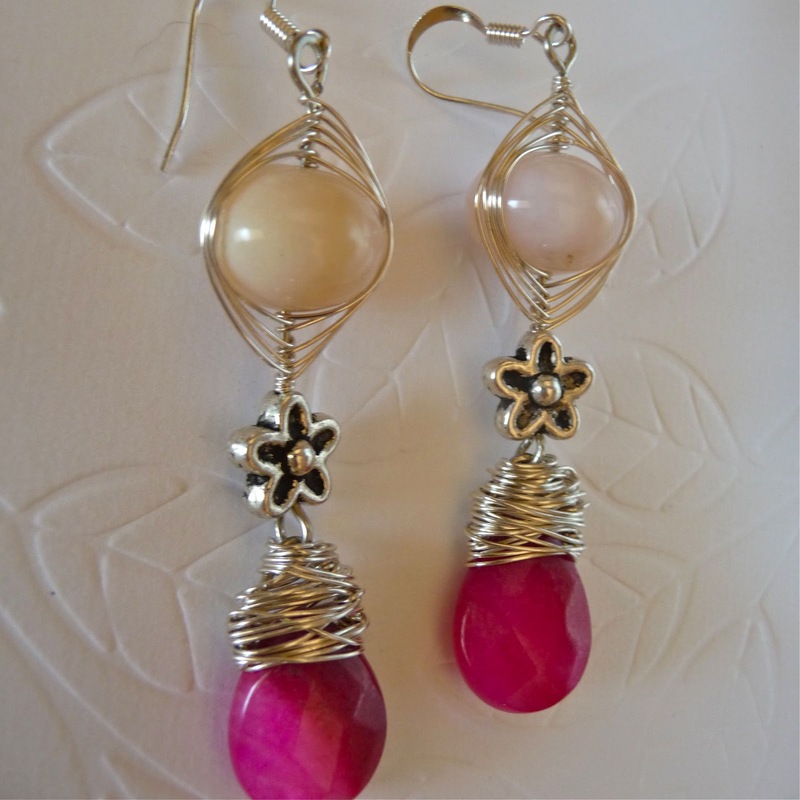 My jewelry designs are simple, feminine and easy to wear, featuring beads, charms and other handcrafted details. If you're going to learn to work with wire, practicing by making classic elegant designs is just plain smart. They are classic for a reason...and you will learn all the basic skills needed to handle future wire projects with finesse! In the most recent addition to Kalmbach's Absolute Beginners Guide series, readers will learn about wire types, tools, findings, and a lot more. 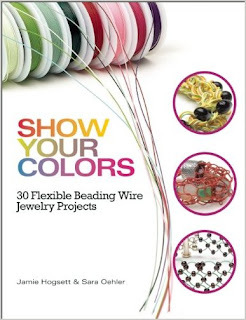 Martine Callaghan has put together 28 beautiful projects in Making Wire Jewelry which will teach you all the basics and will leave you with a closet full of beautiful new adornments. 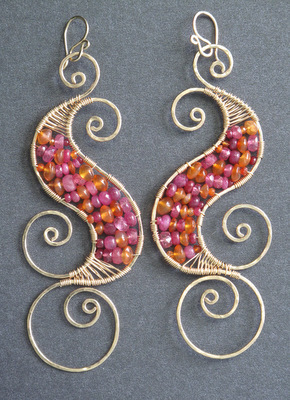 Even though I've been turning wire loops and spirals for more years than I care to admit, I am really impressed by how perfectly beautiful Martine's are, mixed with just the perfect beads and pendants. Great projects, wicked versatile techniques, the usual easy-to-follow instructions that you expect from Kalmbach. Check it out! How cute are these links and this clasp? And they are soooo easy to make too. This project is a teaser to get you interested in the book that I'll be reviewing tomorrow. And guess what? I'll also be giving it away!! When I found a gorgeous strand of top-drilled pearls at a gem and bead show, I knew that they would need a design that allowed them to show off! 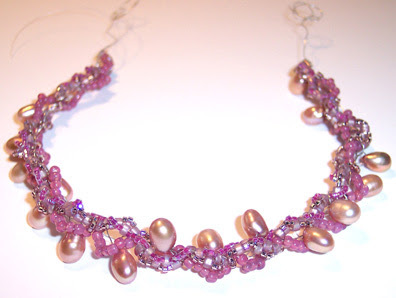 I began by creating several strands of single crochet with the pearls on silver wire, and then embellished each strand with loops of seed beads. 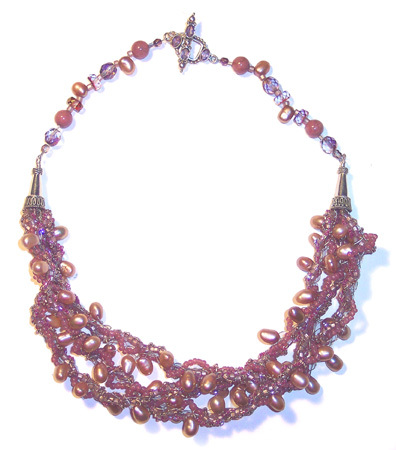 The necklace was finished off with single strands of strung beads so that it would be comfortable against the back of the neck. 1. 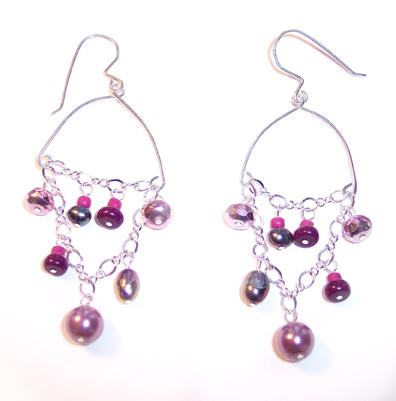 String 20 top-drilled pearls on 28 gauge silver wire, alternating the pearls with one of your 8/0 seed bead colors. 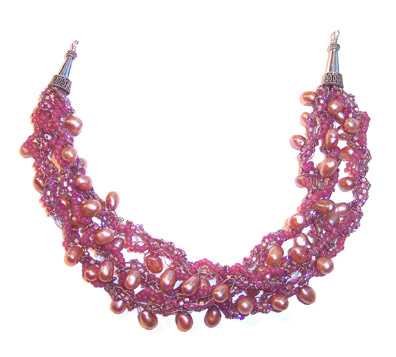 Start and end with a seed bead. 2. 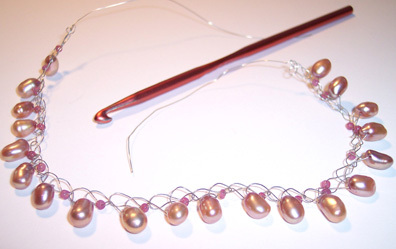 Single crochet the wire strand, adding one pearl or one seed bead in each crochet stitch. Leave approximately 4 inches of wire at each end. You can roll it up to keep it out of the way as you continue to work. 3. Take as long a piece of Nymo thread as you can comfortably work with. Tie the thread securely to one end of the crocheted strand, leaving a 3 inch tail. Using the same color 8/0 seed beads as in step 1, proceed to string from seed bead to seed bead all along the crocheted strand. In my example, it took approximately 7 beads to arch nicely from bead to bead. Do not skip any of the wired beads along the way. 4. When you reach the end of the strand, tie the thread and start back in the other direction. This time, use the other color 8/0 seed beads. Twist the strand as you again string from wired bead to wired bead. In my example, I used approximately 5 beads for each arch, in order to enhance the twisting effect. At the end of this pass, tie the thread to the original tail. 5. For your third pass, begin to add small arches of one of the Delica colors to the beads that you added in step 4. I added from 3 to 5 small beads at a time, weaving them in and out of the previous row. Make some of your arches across the wired beads rather than through them, twisting as needed to make the strand look full. Tie a knot at the end. 6. For your final pass, repeat step 5, using the second color of Delicas, and creating your arches in different spots than before. Tie the thread off, and add a drop of glue to the knot clusters at both ends. 7. Create two more twisted strands, following steps 1 through 6. Breathe a sigh of relief! 8. Loosely braid or twist your three strands together. Twist the wires together tightly at each end to hold the shape. Cut a 3 inch piece of 20 gauge silver wire and turn a small double loop at one end. 9. Pass the twisted wires through the loop and twist them several times around themselves. Clip off close. Thread the 20 gauge wire through one of the bead caps or cones, and create a wrapped loop at the top (photo above). File it smooth if needed. Repeat steps 8 and 9 on the other end (photo below).